Upgrading to VMware vSphere Client 6.7: Should You Do It? NAKIVO Blog > VMware Administration > VMware vSphere Client 6.7: Should You Upgrade? VMware vSphere is currently one of the most popular virtualization platforms, which is partly attributed to its constant development of new features and enhancing of existing functionality. Its latest release – VMware vSphere Client 6.7 – took place on April 17th, 2018 and introduced some additional improvements to both the VMware hypervisor (ESXi) and management console (vCenter Server). In this blogpost we will discuss how the vSphere functionality has changed since the previous release and what new benefits it can provide. ESXi is a bare-metal hypervisor which is used for creating and provisioning virtual machines (VMs). vCenter Server is a centralized platform which is applied for managing all ESXi servers and the VMs running on those servers from a single pane of glass. vSphere Update Manager is a software product that tracks all the latest updates in vSphere and enables automated patch management for eliminating any vulnerabilities in the system. vSphere Client is a Windows application which can directly connect to vCenter Server or ESXi hosts. It provides a graphical user interface (GUI) through which you can monitor and access the computing resources and VMs running in virtual environment. ESXi Quick Boot allows you to rapidly reboot the ESXi server during system updates or upgrades by avoiding re-initialization of the physical server. Instead, if the OS needs to be restarted, only the ESXi host is shut down and then immediately rebooted. This feature is integrated into vSphere Update Manager and can be enabled manually during host patching. With Quick Boot, you can significantly reduce time spent on patch management and upgrading. ESXi Single Reboot helps shorten the time needed to perform major system upgrades. The upgrade process previously required two reboots, but ESXi Single Reboot has cut the number of reboots from two to one. Thus, if you are working in large virtual environments hosting multiple VMs, you no longer have to worry about long downtime during system upgrades. Cross-vCenter Encrypted vMotion enables secure transfer of data from one vCenter server instance to another due to the use of encryption. With this feature, you can not only move data from one data center to another, but also perform data center migrations without worrying about your data getting compromised or corrupted. Trusted Platform Module (TPM) 2.0 and virtual TPM (vTPM). TPM was specifically designed to perform cryptographic operations, such as creating and storing passwords or encryption keys. VMware vSphere 6.7 provides support for TPM 2.0 because it enables one of the vSphere features – Secure Boot, which was introduced with vSphere 6.5. Secure Boot ensures that any driver or application loaded on the ESXi host can be trusted by checking whether it is cryptographically signed. Moreover, vSphere has introduced support for vTPM, which is used to protect VMs. Thus, this feature ensures a high level of security within your virtual environment. VMware vCenter Server Appliance Backup Scheduler can be used for scheduling backups. The schedule can be set up to run backup jobs daily or weekly, or you can create a custom schedule based on your needs and preferences. Moreover, Backup Scheduler allows you to select the number of backups which you want to retain. Enhanced vMotion Compatibility (EVC) is applied when the data is moved across data centers (on premises and the cloud). This feature allows to create and assign EVC baselines on a per VM basis, rather than on a per ESXi-host basis. Thus, you can modify all ESXi hosts in a cluster to share the same CPU features, which ensures seamless migration of workloads. HTML5-based vSphere Client has replaced Flash-based vSphere Web Client. Thus, you can now enjoy the benefits of working in a simple and intuitive user interface. Thus, VMware has extended the functionality of vSphere Client, which simplifies the process of managing daily workloads and multiple vSphere components. Instant Clone allows you to create a powered-on copy of a VM at a particular point in time, meaning that the clones are created in a fully operational mode and are ready for use. This feature can be accessed through API. Instant clones share a virtual disk, as well as memory, of a source VM and, therefore, require less storage space than full clones. Moreover, you do not need to power off a parent VM to create instant clones as this technology allows you to create identical copies of the running VMs. Thus, this feature ensures better use of memory, simplified patching, and seamless resource provisioning. Persistent Memory is a byte-addressable form of computer memory. Persistent Memory is regarded as a type of non-volatile dual in-line memory module (NVDIMM) that allows you to operate in a storage with the following characteristics: DRAM-like latency and bandwidth, DRAM byte-level access, regular load/store CPU instructions, and DRAM-like OS memory mapping. The main benefits of vSphere Persistent Memory is that it reduces the load on infrastructure and cuts the time spent on maintenance and upgrades. Scale Enhancements. VMware has increased some of the configuration maximums to provide support for even larger virtual environments than before. The following table will demonstrate how key scale metrics have changed across vSphere versions. Should You Upgrade to VMware vSphere Client 6.7? The latest vSphere version provides multiple benefits that can significantly improve your experience in a virtual environment. These benefits include built-in security and scalability, lifecycle management, workload optimization, improved memory utilization, accelerated patching, and enhanced app performance. 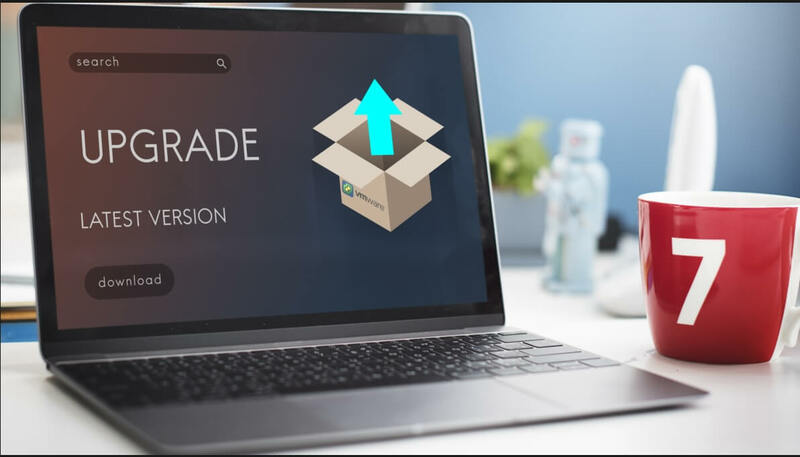 However, before upgrading to VMware vSphere Client 6.7, you should first consider whether its new features can be used to improve your infrastructure and meet your business needs. It is probable that your infrastructure simply doesn’t require new functionality at the moment as your organization can’t derive any benefits from those enhancements. Or, there might be some compatibility issues because your software and hardware do not support vSphere 6.7. Check out the VMware Compatibility Guide to identify whether your infrastructure can support the latest version of vSphere. To ensure that your virtual environment is protected against any malware or hacker attacks and can be securely recovered in case of a disaster, installing our data protection solution is your best option. Compatible with VMware environment, NAKIVO Backup & Replication can significantly improve VM backup performance and transform your disaster recovery strategies. Moreover, the product supports the latest version, VMware vSphere Client 6.7, meaning that VMware users can still enjoy the benefits of NAKIVO Backup & Replication in their newly-upgraded VMware environments. As you can see, NAKIVO Backup & Replication has a lot to offer. Its set of built-in features can serve the needs of various virtual environments, whether large or small. Request a live demo by one of our engineers or download a full-featured free trial to test the product in your virtual environment today and see for yourself the multiple benefits that it provides.